Why the need for replacement windows? Keep your home or office warmer in the winter and cooler in the summer. Take advantage of government benefits that reward advanced, energy-efficient replacement windows. Go green and contribute to a better planet with a new replacement window. New replacement windows can be ordered with Low-E coatings that block damaging sun rays. New replacement windows are installed correctly and keep your home buttoned up tight! If the frame of a window is damaged, it can be repaired but the better option is to replace. A repair won’t last as long and doesn’t look as nice. Window replacements are necessary for hail damaged windows, sun-damaged windows and old windows. Old windows can settle, become brittle or crack. A new replacement window will fix all these issues. A replacement window functions better than your old window; the slider will slide easily and each new replacement window comes with a new window screen. A replacement window is a completely new window. Our windows are manufactured in Arizona, USA of the highest quality materials and come with Energy Star approval. Our high-strength vinyl windows come with new double pane units and can be ordered with Low-E tinting. Each replacement window comes with a brand new window screen. 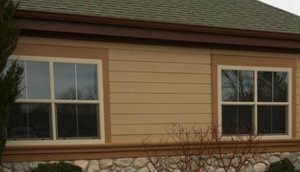 When can replacement windows be installed? First, contact us. We’ll schedule a time during business hours, usually within 1 day of your call, to inspect & measure the windows that need replacing. Once you give approval, we’ll order your custom new window replacements. A new window normally takes 2-3 weeks to manufacture and ship. Once it arrives, we’ll call you and schedule a time for installation. You will need to be home during this installation time period. Please note our installation policies. We’ll work with you gain entry into the residence, and work according to your schedule. We work with lock boxes, tenants, homeowners and property managers frequently and understand how to schedule to meet your unique needs. Where does Lightning Glassworks & Screens install replacement windows? How does the replacement window process work? Once we schedule a time for replacing the window, we’ll pick up the window from our manufacturing partner. Please note our installation FAQ. Then, we ring your doorbell, bring in our tools and prep the replacement window for installation. After that, our team will completely remove the old window and take it with us for disposal. Then, we install the new window, level it, and seal it with industrial strength polyurethane. Finally, we clean up any mess (usually minor) and bill you onsite. We accept check, cash or credit card.